Key identifying traits: A distinct silvery-white bark with black markings, small triangular leaves with toothed edges. Light green leaves changing to bright yellow in autumn. In the wood: May be found in broadleaf woodland within the canopy layer. Mature trees can grow up to 30m tall. A pioneer species, a fast growing tree that does well in open areas or areas that have recently been swept by fire. Uses: It has long thin branches that were traditionally used to make besom brooms that is the traditional broom that witches (and now Harry Potter) fly around on. When dry, birch twigs are good kindling for starting fires. The dry bark can also be used as a tinder. In spring, the sap can be 'tapped' and drunk as it is or turned into syrup in the same way as with maple. The oils in the bark have anti-viral, anti-inflammatory and anti-cancer properties. In countries where temperatures reach way below zero, the bark grows thicker than in the UK and can be used to make items such as canoes, storage pots and decorative items. Can you see the open ground and brambles? This patch of land used to be used for growing vegetables but is now used less enthusiastically! If bare land is left alone 'ecological succession' will take place. This is the change in species composition over time as available resources change. The natural process by which one habitat turns into another i.e how a bare field turns into woodland. 40 years ago Snowdrop Wood (the woodland you see in front of you) was a field, much like those that surround it, but thanks to people leaving it alone and the phenomenon of ecological succession, it is now a young woodland. The first species to grow on a recently bared area of land are known as pioneer species and include bramble and nettles. Ash and birch are also pioneer species. Bramble and nettles are also often found in the shrub layer of broadleaf woodland. This layer contains mostly woody plants that grow from roughly knee to head height. Deadwood provides an important micro-habitat on the ground layer of a broadleaf woodland. Many invertebrate species, such as woodlice, beetles and millipedes make their home here. In unmanaged woodland deadwood is provided when trees fall or drop branches. In managed woods, for reasons of safety, we often need to cut these down before they fall. To recreate this habitat, it is good to leave piles of logs and branches around. Did you know: Conifer trees retain their dead branches for a lot longer than broadleaved trees. In coniferous woodland the ground layer is formed of a thick, spongy layer of fallen needles. Origin: Non-native, probably introduced to the UK in Tudor times (1500s), although others say that it is one of the many things that the Romans have done for us. Key identifying traits: The sycamore is recognisable by it’s typical maple lobed leaves. The leaf stems on younger trees have a distinctly red colour. Its winged seeds are known as samara or ‘helicopters’. Have you played with them before? In the wood: May be found in broadleaf woodland within the canopy layer. It casts a dense shade. Mature trees can grow up to 35m tall. Did you know: As a non-native tree it hosts fewer other species compared to natives like the oak but aphids love it! When covered in aphids it hosts a high biomass but low biodiversity (lots of individuals but few species). For a species to be considered 'native' it must have been here since the last ice age, about 10,000 years ago. You will often find animal burrows in woodlands. The three largest and easiest to spot are made by badger, fox and rabbit. You may also be able to find their droppings or tracks nearby. Finding burrows can also tell you about the ground layer beneath the woodland. Looking at the composition of the soil that has been kicked out can tell you what the soil structure is like? Different soils will enable different types of plants to thrive, affecting the structure of your woodland. Is it sandy or more clay-like? If you look around you may spot plants that are growing through multiple layers. The most obvious one in this woodland is ivy but you might also spot honeysuckle , bryony and wild clematis if you look carefully enough. Ivy is a climbing plant. In a woodland it will grow across the ground as well as climb up trunks and branches of trees, spreading through the layers all the way to the canopy. In areas of temperate rainforest where rainfall is high, such as the Wye Valley, you can also find epiphytes - plants that grow without soil (usually on other plants). This area is known as Celtic Rainforest (look it up, it's a thing!). In temperate areas these include plants such as ferns growing on top of tree branches, or mosses and lichens growing on the bark. Key identifying traits: Large black buds, greyish brown bark and small oval leaves in opposite pairs. It’s winged seeds hang in bunches known as ‘keys’. In the wood: May be found in broadleaf woodland within the canopy layer (the top, highest layer made up of the tallest trees) . Mature trees can grow up to 35m tall. Key identifying traits: Leaves are round to oval, doubly toothed, hairy and pointed at the tip. Has a smooth grey-brown bark. In the wood: May be found in broadleaf woodland within the understory layer. A smaller tree growing up to 12m tall. Produces nuts that are fed upon by many woodland animal species. Uses: Hazel is often coppiced producing long, straight stems, useful for making many woodland craft items, including fences and tool handles. Also often considered a magical tree, good for making wands! Many different plants may grow in the lower layers of a broadleaf wood. This woodland has a mix of wild and cultivated plants in its herb layer (non-woody plants that grow up to around knee level). Many spring ephemeral species (bluebell, wood anemone, snowdrop and others) are found in this layer of the woodland. They grow and flower in early spring before the trees put out their leaves to make the most of the available light. Once the trees leaf many will die back as the light levels reduce. The shrub layer of a woodland contains mostly woody plants that grow from roughly knee to head height. This includes plants such as nettle, bramble and bracken. The shrub layer can provide dense cover for larger animals such as deer to hide in and find safety. In some woodlands the herb and shrub layers may be a lot less dense or almost absent. This can be a sign of overgrazing from too many deer or from the presence of grazing domestic farm animals. However, in woods dominated by beech or conifer trees these plant layers are reduced as the leaves/ needles densely cover the ground preventing plants below from growing. Key identifying traits: The holly is recognisable by its sharp, pointy, broad, evergreen leaves. In winter the female may have bright red berries which are a source of food for many birds. 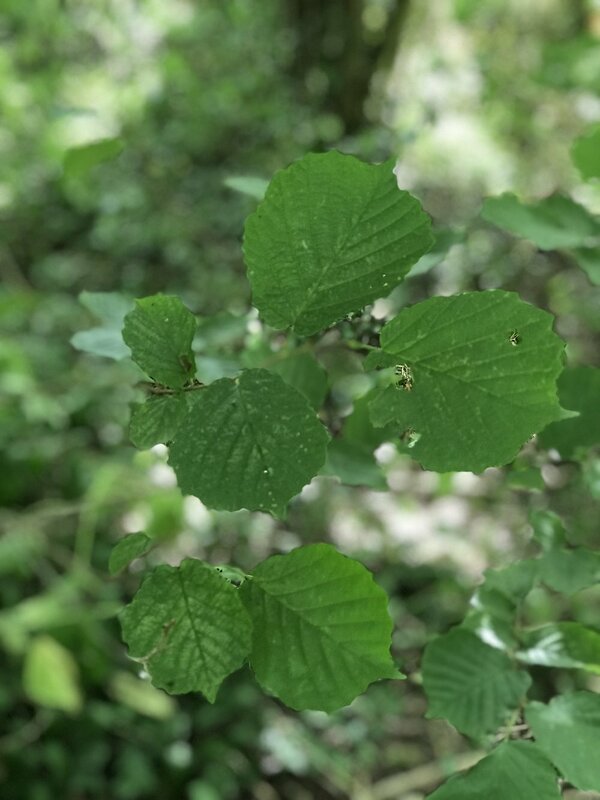 In the wood: Often found in broadleaf woodland within the understory layer (this layer contains smaller trees that grow above head height but do not reach the level of the canopy). Mature holly trees can grow up to 15m tall. Uses: A good wood for carving, traditionally used to make items like bobbins, chess pieces and inlay work on furniture. Within woodlands you may find openings and clearings, both natural and man made. These open up areas of the wood to more sunlight allowing species in the lower layers to thrive. Flowering plants and butterflies love these sunny openings. Rides - a linear trackway, man made for access. Glades - openings within a woodland, naturally caused by falling trees, storms, fires or animal trampling, or man made. Many species prefer to live in the first ten metres from a woodland edge, where there is more sun-light. In the transition from rides/glades to deeper woodland you can find higher biodiversity, this is an example of edge effect. Can you see how the land slopes here? Topography refers to the surface features or lay of the land. Gravity will pull soil particles and water downhill so soil depth and water availability tend to be greater at the bottom of a slope compared to the top. This can affect which plants will grow where in a wood with variable topography. Aspect is the compass direction a slope faces when you are standing on it looking downhill. Aspect influences the intensity of sunlight reaching the ground, which in turn can affect soil moisture levels. Slopes that face north and east tend to be darker, cooler and moister than slopes facing south and west. Can you figure out which direction the slope here faces? The hedgerow here has recently been laid by partially cutting through the stems and laying them in a more horizontal position this encourages new and more dense growth. Hedgerow laying is a traditional, sustainable method of woodland management. Hedgerows play an important role for wildlife as a source of food, nesting location and as wildlife corridors. They act as safe paths for wildlife to move along between separated habitats. Dormice use hedgerows to move from one woodland to another in search of food and mates. Having well connected habitats can lead to healthier populations of species. Why does this tree grow like this? These hazel trees have been coppiced, where the branches and trunks have been pruned back to ground. This is like pollarding but done down to ground level. Hazel tends to grow with many stems but if left untouched those stems often rot. Coppicing invigorates future growth and encourages the new stems to grow long and straight. Hazel is maintained in this way to provide wood for use in making hurdle fencing, pegs, and other items, and also for charcoal making. This is a traditional, sustainable method of woodland management. You are in front of a stand of conifer trees. These are the evergreen trees. Find a spot under the trees that makes you believe you’re in a coniferous woodland - go on, jump in! What do you see and how does it feel? Measure and record the light, pH and moisture levels here. Collect some items from around you that you find interesting and represent the area and put them in the plastic bag provided. You’ll do the same in a broadleaf area, remember this coniferous area and compare the two. There are a mix of different species in this stand of conifers (trees with needle leaves instead of broad leaves). Most conifer trees are evergreen (keep their leaves all year round). These woods tend to have lower light levels throughout the year. Below ground the roots of a conifer tree tend to be quite shallow and spread out in order to max-imise water uptake when it rains. There are only 3 native conifer species in the UK: Scots pine, juniper and yew. Key identifying traits: Young leaves are lime green with silky hairs, becoming darker and lose their hairs as they mature. A medium sized leaf, stalked, oval and pointed at the tip, with a wavy edge and distinct ribbing. Smooth greying bark. In the wood: May be found in broadleaf woodland within the Canopy layer. A tall tree growing up to 40m tall. It’s leaves are slow to decompose and can cover the floor preventing plants growing below. Uses: A hard wood used for furniture. It’s nuts traditionally fed to pigs. Often grown as a garden hedge.